The Etymology Of Crime – Tyburn. It’s been a while since I last posted due to work and other commitments, so I’ll be offering a series of shorter posts dedicated to the etyomology of crime in general, interspersed with the occasional longer post about other things. It’s always been curious to me how many words and phrases have crept into common usage courtesy of the underworld. A great many of them are used by that perfectly honest, law-abiding people who probably haven’t the slightest idea of their original meaning. So, for openers, I’ll start off with the dreaded Tyburn, Tyburn being roughly where Marble Arch now stands and once the site of London’s premier public entertainment. That entertainment being public executions. Tyburn had it’s own gallows, a purpose-built triangular contraption capable of hanging up to 24 inmates at once (it never actually did, by the way) and it was known as the Triple Tree. 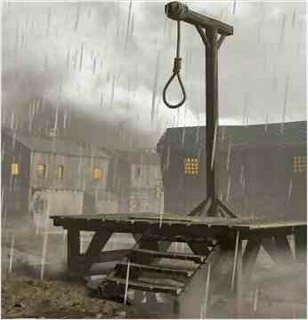 In the days before purpose-built gallows it was common for a condemned prisoner to be placed on a ladder resting against a tree and the ladder would then be turned so they fell and slowly strangled. Hence, a condemned inmate in those days would be thoroughly justified in feeling somewhat ‘Turned off.’ which is also the origin of the old wive’s tale that it’s unlucky to walk under a ladder. Ever had the feeling that people were ‘Pulling your leg’? Not in it’s original sense, you haven’t. Modern judicial hanging involves a precise ‘drop’ calculated using the inmate’s height, weight, physical condition and build. This didn’t appear until the 1870’s so, at Tyburn, death was by a standard drop for every prisoner. In order to avoid seeing a prisoner suffer unduly from slow strangulation a prisoner’s friends (or perhaps ‘Jack Ketch’ himself) would grab their ankles and pull, tightening the noose and either strangling them faster or breaking their neck. Hence, if somebody’s ‘Pulling your leg’, what they’ve said or done might seem spiteful but it’s meant in the nicest of ways. How fascinating! Just found this via Sarah Vernon and First Night Design – very enlightening! Previous Previous post: Edith Cavell – Hand-wringing propaganda is not enough. Nor does it do her any service. Next Next post: ‘Doctor’ Crippen, Hanged Today In 1910. Innocent? Or Hanged For The Wrong Murder..?